The definitions of conceptual coherence often combine the cohesiveness and consistency properties of conceptual knowledge. Coherence is a definition that is applicable for characterizing the states of the elements of some larger units (eg. phenomenological primitives, epistemological resources). Coherence is also related to the contextual and time-related dimensions. Cohesiveness is the property characterizing the conservation of inherent relationships among ideas in one explanation framework or the links among several related conceptual frameworks. Consistency is defined as a property indicating that students’ explanations of a certain phenomenon are stable, independently of the variable contexts that depend on the viewpoint of the explanation. It means that students are able of activating same locally coherent sets of ideas again and again in time, independent of task contexts. That study in 2006 was conducted under the cognitivist (representational mental model) framework that i abandoned in next years being fascinated of distributed cognition and ecological learning models. This PhD study looks coherence and continuity in the context of embodied and distributed cognition. It uses coherence and continuity to address the sense-making practices by means of which relations of signification are established within and across contexts and situations. Coherence denotes the achievement of order, whether within or across a given problematic or situation. Continuity refers more explicitly to the achievement of coherence across settings and activities, which has been traditionally investigated as the question of transfer. 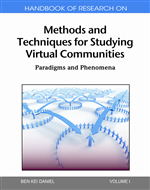 The coherence and continuity of any set of ideas or concepts, as made relevant by the participants during joint activity, cannot be analyzed in terms of a priori formal properties of either the material setting (e.g., texts, graphs, demonstrations) or the individuals’ thinking (e.g., a learner’s mental representations of texts, graphs, or demonstrations), but must be treated as the result of material and practical operations that involve both. an initial sense of similarity motivates action that transforms the situation, which in turn allows for the eventual achievement of a new conceptual way of accounting for a new existing order. Inference, as a cognitive process, does not precede, but rather is the outcome of, a larger unit of activity. Reading this PhD study and my old research made me think of my other thoughts about the formation of cultural patterns as niches, that may be described using both of these concepts – coherence and the consistency. I think coherence and consistency are important both in the circles of personal pattern formation and stabilisation, as well as cultural pattern stabilisation, since both are formed as niches from instances of experiencing. So coherence in pattern or meaning niches requires to be formed across different contexts. How do these instances of experiences align themselves into the coherent pattern or meaning that we can perceive? 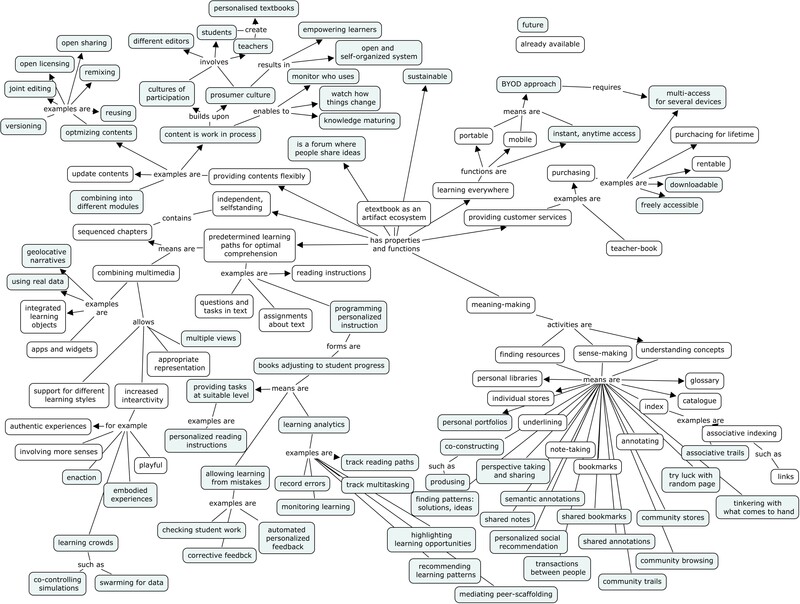 Is it the distributed nature of those different context experiences that some ways form a consistent network like in the connectionist models? On the other hand how from the contextual coherence point of view do individuals activate cultural patterns and align them with own experienced patterns? The consistency of patterns and meanings suffers from time delay and the bubble effect. So from the ecological learning point of view it is personally rather not useful to create consistent cognitive patterns but keeping them open to chance events that can destabilise them from coherency. I wonder how many recommender systems focus of destabilisation processes rather than stabilisation ones. 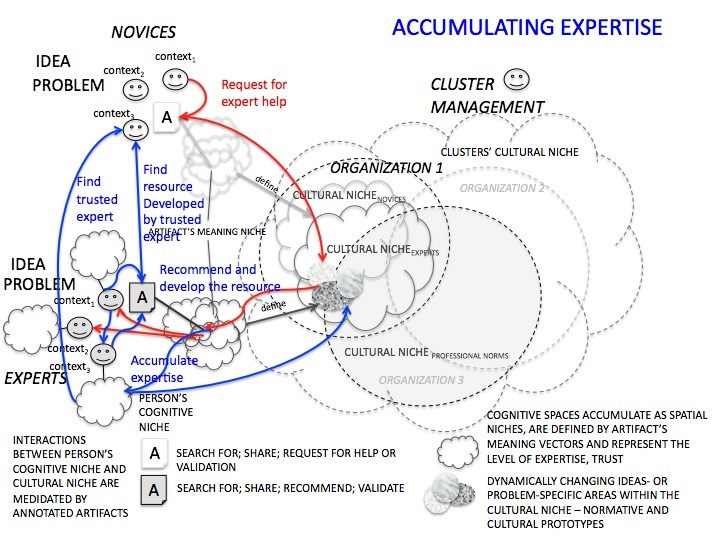 Explaining informal learning@work at managed clusters organized as TEL based socio-technical systems requires binding different level explanations: distributed cognitive level, personal – organizational level, cross-organizational network – cluster level. 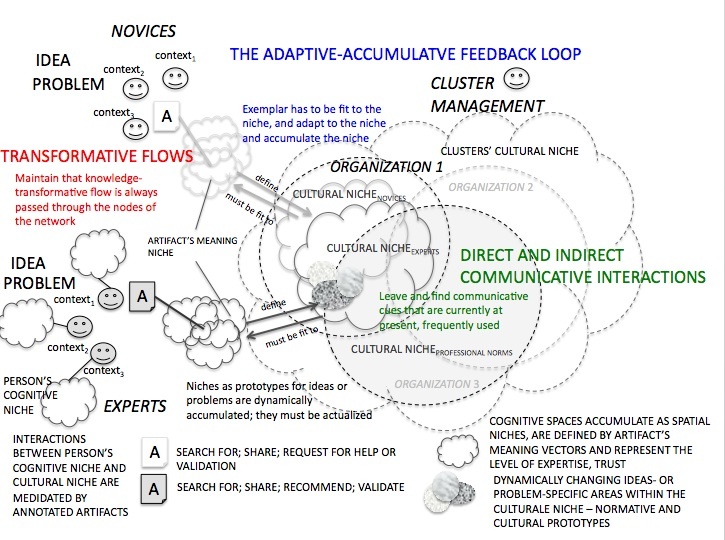 Benefits: Focusing on the systemic nature of distributed cognition (on the interplay between the epistemic distributed cognition from the agents’ side and the collective distributed cognition of organizational or professional community cultures) allows using the ecosystem principles for describing how learning services emerge and co-exist in this informal workplace learning ecosystem. Distributed cognition makes use of vector-spaces for describing cognitive niches of individuals, cultural niches and meaning niches of resources. 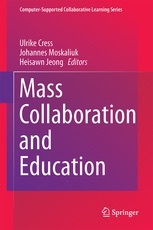 Benefits: to open up the transformative knowledge conversion between individual and organizational knowledge (Nonaka & Takeuchi, 1995); particularly utilizing agents’ informal learning events for the benefit of organization and motivating self-directed learning at work with social and (cross-)organizational factors. Benefits: increased responsiveness for the cluster and for its member organizations is achieved through temporal cross- and inter-organizational informal learning activities at work, and orchestrated bottom-up and top-to-down systemic management of shared knowledge and provision of services based on the knowledge base (see IntelLEO project results for responsiveness). 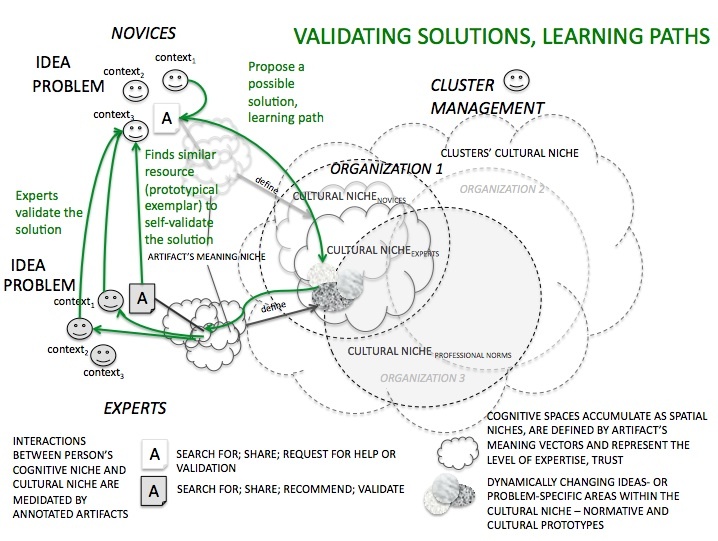 Basically, the systemic cognition approach views socio-technical systems at workplace learning as learning ecosystems. There is a variety of learning services at present (created by experts and in general by any learner), which are used by other informal learners and that accumulate and interact at organization’s and cluster’s knowledge-bases. Scaffolding in networks requires considering the differences of agents’ problem contexts, knowledge and expertise. Self-directed agents create and make use of (request for, validate, share, modify etc.) workplace learning service exemplars when they solve problems or provide help. Each learning service exemplar provided or utilized must be fit to the prototypical learning services niche of his kind. These niches are determined by many exemplars that agents activate. For example, request for help must contain sufficient information about the specific problem and help needed to attract those help-providers that have suitable expertise for tackling this problem, further, the help provided to meet this request must be useful, it should solve this problem as closely as possible. Knowledge transfer is primarily inter-personal. increasing persons’ expertise and trust level in respect of providing help for learning at work. Each prototypical learning service is directed towards solving some workplace problem or conceptualizing some idea. These prototypes have contextual meaning niches that emerge and change dynamically as a result of many agents’ activation of the exemplars of that kind. These meaning-niches are like communicative signals offloaded to the socio-technical system. They serve as attraction basins indicating to agents, where organizational learning could be most effective. explore the opportunities or develop innovation. controls organizational learning with incentives and motivation-management (policies for accreditation possibilities, and validation of workplace learning experiences). Formal and informal cross-organizational networks are important to transfer knowledge. The learning services the cluster can initiate depend on the abundance of certain learning service exemplars and of the learning service prototypes and niches at present in the socio-technical system. The first principle in ecology is that the flow of energy and the exchange of matter through open ecosystem is regulated by the interactions of species (in our case types of learning services) and the abiotic component (by the web of energy and matter). 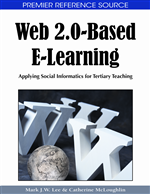 Reyna conceptualized “teaching and learning” as this energy that empowers digital learning ecosystems to changing “information to knowledge”. The permeability of a digital learning ecosystem to the export and/or import of information and knowledge depend on the nature of the ‘architecture’ of the components of the system (e. g. connectivity, clustering), the characteristics of species, and their diversity and distribution, and interactions between them (such as commensalism). The second important ecological principle is existence of the feedback loop to and from the environment that enables species to be adaptive to the environment and the environment to change as a result of species. A recent literature in evolutionary theory elaborates the notion of niche construction as an ecological factor that enables organisms to contribute for and benefit from environmental information. If organisms evolve in response to selection pressures modified by themselves and their ancestors, there is feedback in the system. In our approach to digital learning ecosystems, the “service-species” are activated by users with different roles (learner, facilitator) and their learning intentions. 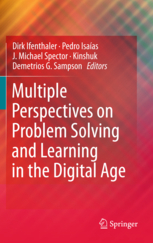 The niches for each service-species in the digital ecosystem may be collected from user-behavior, for example by learning analytics (an emerging approach to tracing digital footprints of learners and groups, visualizing the learning-related patterns). 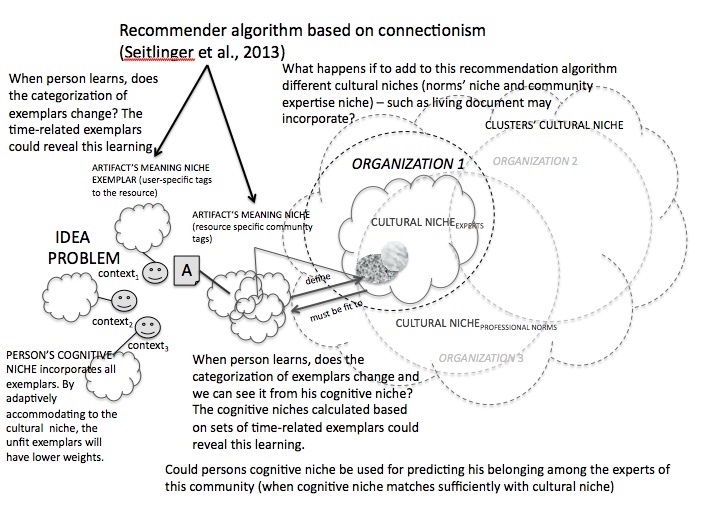 If we make use of the Connectionism approach to concept-processing (see the paper of Seitlinger et al, 2013) and extend this approach to epistemic and collective distributed cognition that happens in using mobile learning tools together with social semantic server, we may have an approach for socio-semantic recommendations that provide help based on the meaning niches that fit best to the requests (see the examples below). In biology the figures for niche breadth figures are used, that may be useful in recommendation, also the idea of fitness landscape and attraction basins may be considers in recommendations. The third important principle that we extend from ecology to technology-enhanced learning domain is associated with the communicative interactions between species. The digital community is a naturally occurring group of “service-species” populations in e-learning ecosystem who inhabit the same habitat (but use different niches) and form temporary coalitions (communities). For example the mutualisms such as parasitism, symbiosis or commensalism may appear between service species are associated with sharing the resources and associate with our first principle (energy and matter exchanges in the network). Other type of interactions, based on communication, which assumes mutual awareness, signaling between agents (or using the accumulated signals left into the environment) may be distinguished as well. Below, there are three informal learning and supporting behaviours that may potentially appear in socio-technical systems. To introduce new knowledge to the newcomers the experts make use of their earlier experiences, they also utilize and evolve resources for providing help, as well as the archetypical scaffolding models in their profession, on the other hand, the help-provision increases the trust level of experts in respect of solving certain problems. First layer can have distributed activation. 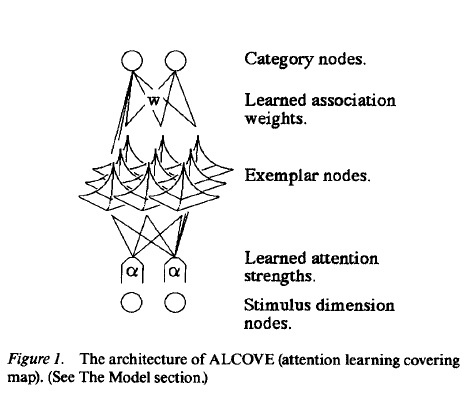 The model is initialized with equal attention strengths to all dimensions, but as the training proceeds, the model learns to allocate more attention to relevant dimensions and less to irrelevant dimensions. 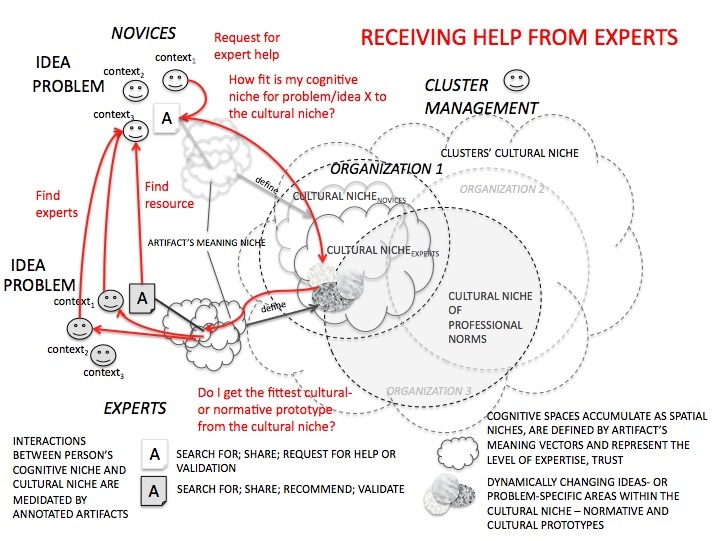 Internal layer functions as agent’s cognitive niche that incorporates cultural niche for weighting. Internal layer gives weights to the nodes, each hidden node corresponds to a position in the multidimensional space. A state of activation (a) at a given time (t): The state of a set of units is usually represented by a vector of real numbers a(t). These may be binary or continuous numbers, bounded or unbounded. A frequent assumption is that the activation level of simple processing units will vary continuously between the values 0 and 1. In biology, Hutchinson (1957) defined niche as a region (n-dimensional hypervolume) in a multi-dimensional space of environmental factors that affect the welfare of a species (in our case prototypes). Niches have been conceptualized as the collections of environmental gradients with certain ecological amplitude, where the ecological optimum marks the gradient peaks where the organisms (in our case exemplars) are most abundant. The welfare of species can be determined by meaning-creation and action-taking possibilities in the environment. In the gradient concept structural ecosystem properties are comprehended as concentration gradients in space and time (Müller, 1998). Any niche gradient is a peak of the ﬁtness landscape of one environmental characteristic (Wright, 1931), which can be visualized in two-dimensional space as a graph with certain skew and width, determining the ecological amplitude. The shape of the fitness graph for certain characteristic can be plotted through the abundance of certain specimen (exemplar in our case) benefitting of this characteristic. All niche gradients are situated and establish a multi-dimensional hyper-room, which axes are different environmental parameters. This connectionist theory problem was also explained by T. Ley in Innsbruck meeting.